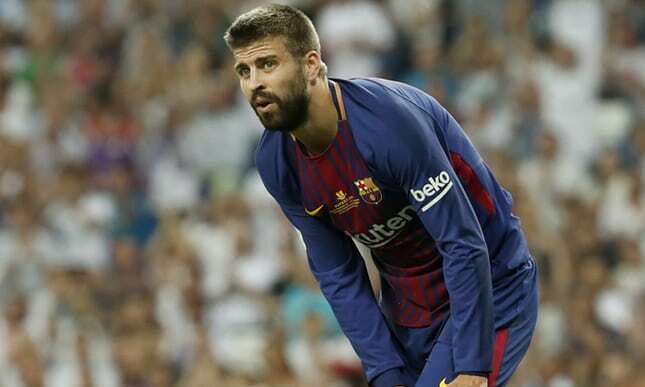 Gerard Piqué admitted he felt “inferior” to Real Madrid for the first time in his nine years as a Barcelona defender, after they were beaten 5-1 on aggregate in the Spanish Super Cup. A 2-0 defeat at the Bernabéu on Wednesday night saw Barcelona humiliated by their rivals, with Sergio Ramos winding up Lionel Messi by throwing the ball over him after the Argentine readied his hands to collect. The victory means Zinedine Zidane now has won seven trophies in his 20 months in charge, in which time he has lost just seven matches. Goals from Marco Asensio and Karim Benzema sealed this latest triumph, as Barcelona appeared to again struggle without Neymar, who joined Paris Saint-Germain for a world-record fee earlier this month. Ernesto Valverde, who replaced Luis Enrique as the Barcelona manager in May, is still settling in to his new job but already the former Athletic Bilbao manager has a major task on his hands. Meanwhile, Pep Segura, the Barcelona general manager, said he expected Philippe Coutinho and Ousmane Dembélé to join the club from Liverpool and Borussia Dortmund respectively. “We are discussing their deals but do not know when it will be done,” he told Catalan television station TV3. “We know we have to strengthen this team and that is what we are doing,” Segura added. “We have to help the team”. One player Barcelona already have signed this summer is the Brazilian midfielder Paulinho. The former Spurs player is joining for €40m (£36.4m) from Chinese side Guangzhou Evergrande and will be unveiled on Thursday.